Has it been a whole year already? Yes, it has. It was one year ago today that I revealed to the world at large that December 7 is—in addition to being the anniversary of the 1941 Pearl Harbor attack—the birthday of the protagonist of two of my novels. 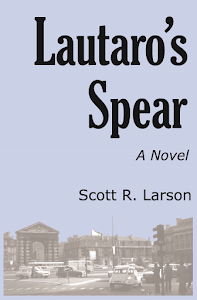 It would be more than nine months after that, however, before readers would get a chance to learn for themselves how and why Dallas Green’s birth date figured into the plot of Lautaro’s Spear. In the book’s final chapter, it turned out that he celebrated—if that’s the word for it—his birthday alone as the culmination of a rather interesting and ultimately difficult year. And there was one last surprise awaiting him that night. I wonder if his birthday this year, 37 years later, is equally interesting for him. That’s the funny thing about fictional characters that you create yourself. You get to decide what happens to them—up to a point. Last year, when I teased the story to be recounted in Lauraro’s Spear, it was all subject to change. In fact, the first draft was only half-complete at that point. I could make Dallas do anything I wanted him to do—subject, of course, to my desire to keep his character consistent—and I could make anything happen to him that I wanted. That’s quite a bit of power. His life between 1971 and 1980 was completely in my hands. Now though, the book has been published and the events in Lautaro’s Spear are canon. Short of a trick à la Dallas (the old TV series, not my character) like saying the whole book was a dream, I cannot change what has happened to young Mr. Green. It is part of history. On the other hand, his life from December 1980 onwards is all mine to play with. Every morning I wake up with my barely conscious mind playing out new scenarios for the ensuing years, leading up to probably 1993. I have learned to savor this part of the writing process. No more than one’s own personal life, there is something grand about having every possibility still ahead of you. This process of weighing and pondering and inventing will go on for some time. 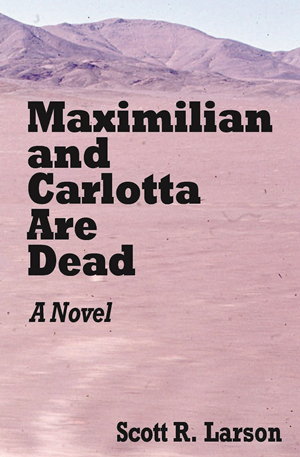 As before, I think it is good and necessary to put a healthy gap before the next installment of Dallas’s life by writing something completely different in between. That something will be the supernatural adventure I have wanted to write ever since, well, all those afternoons I ran home from school with the aim of being in front of the television in time to catch the latest episode of Dark Shadows. Is it too soon to start teasing it already? Well, I can tell you that it involves a very old house on a mysterious island in Puget Sound. I have been looking around for old houses that I could use as inspiration and perhaps even an eventual book cover. 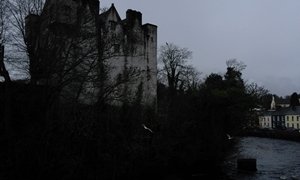 Fortunately, there is no shortage of such structures in the west of Ireland. I lately came across this photo that my wife took when we were visiting the town of Donegal earlier this year. What do you think? It definitely has the right vibe, although it is technically a castle rather than a house—and it does not look like it is on a small craggy island in the sea. It is certainly a start, though. I have already done much of the work on another important part of the writing process: creating a spooky music playlist on Spotify for all those hours of staring at the keyboard. 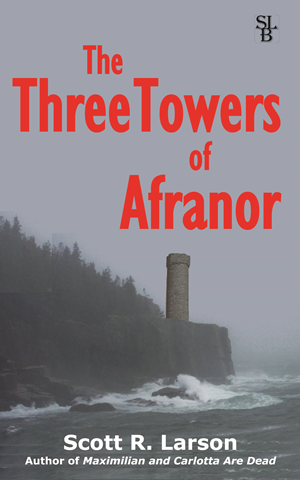 This is probably a good time to mention that Lautaro’s Spear is, of course, still on sale—as are Maximilian and Carlotta Are Dead and The Three Towers of Afranor—in paperback and various digital formats, and the links for ordering all of them are somewhere on this page off to the right-hand side. Also, Christmas will be here soon. You probably have people on your shopping list, who like to read and who may not have read any or all of these books. Work out for yourself the best thing to do.